November 25, 2015 – Thanksgiving is a time for food, family and fellowship. For Maryland family farmers, it’s also a time to be thankful that the year’s crops have been harvested and that their animals have had another year of superior care. Recently completed USDA census data has found that that 97 percent of farms in the U.S. are family-owned businesses. These farms are very diverse, but remain the core of the U.S. agriculture industry. On Pleasant Valley Farm, family is the centerpiece of the farming operation. Located in Brookville, Md., the farm is run by two father-son partners: Robert and Randy Stabler and Breck and JB Debnam. Randy’s daughters, Kelsey Thomas and Shelby Stabler, are also involved in the day-to-day operations. 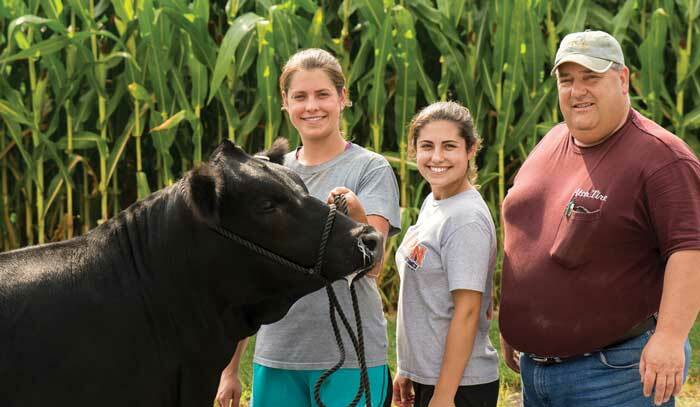 Pleasant Valley Farm grows soybeans and corn on 2,500 acres, as well as selling natural, grain-fed Black Angus beef and fresh sweet corn at their farm stand. Pleasant Valley Farm was originally started by Robert Stabler and his brother, Drew in 1954. In 1987, Randy came into the partnership; and in 2001, Drew withdrew. Fast forward to 2011, and the Debnams joined the partnership; merging the two farm families together. To learn more about soybeans and how they are used on Maryland farms, visit www.www.mdsoy.com. The Maryland Soybean Board administers soybean checkoff funds for soybean research, marketing and education programs in the state. One-half of the checkoff funds stay in Maryland for programs; the other half is sent to the United Soybean Board. To learn more about the Maryland Soybean Board, visit www.www.mdsoy.com.